You are here: MPI Website /Communication /News /Focus on - Overview /Can Arctic winter sea ice disappear abruptly? Can Arctic winter sea-ice disappear abruptly? In a new study, Sebastian Bathiany and his colleagues Dirk Notz, Thorsten Mauritsen, Victor Brovkin and Gaby Raedel from MPI-M have examined the loss of Arctic sea-ice. They found that abrupt sea-ice loss can occur in winter even without feedback processes. The large sensitivity of the winter sea-ice area is caused by the asymmetry between melting and freezing. The scientists also addressed whether abrupt winter ice loss might be a reversible phenomenon and whether it could be anticipated from observations. The loss of Arctic sea ice is one of the clearest indicators of the ongoing global warming. In particular the rapid loss of Arctic sea ice during summer has received substantial public attention, often related to the prospects of a possible ice-free summer before the middle of the 21st century. However, Arctic sea ice is not only retreating during summer: substantial Arctic sea-ice loss also occurs during winter. Recently, this loss of winter sea ice has been illustrated by a series of monthly-mean record-low sea-ice coverage in the Arctic, starting in October 2016 and continuing until at least February 2017 (see fig. 1). Fig. 1. Image courtesy of the National Snow and Ice Data Center, University of Colorado, Boulder. Will Arctic sea-ice loss reach a tipping point? The observed Arctic sea ice loss of recent decades has raised the question about the existence of a tipping point, a point of no return where sea ice is lost in a large, abrupt and irreversible event. In a recent study published in the Journal of Climate, Sebastian Bathiany has taken up this question together with his colleagues Dirk Notz, Thorsten Mauritsen, Victor Brovkin and Gaby Raedel from the Max Planck Institute for Meteorology (MPI-M). In contrast to previous studies, they relied not only on a single model but analysed a hierarchy of models from very simple thermodynamic sea ice models to complex Earth System Models from the recent phase of the Coupled Model Intercomparison Project (CMIP5). When forced with steadily increasing CO2 concentrations, these complex models first show a linear decline in summer sea-ice coverage, in agreement with an observed linear relationship in the real world. After the complete loss of summer sea ice, the simulated sea ice still forms each winter until the Arctic winter becomes too warm. This transition from a seasonally ice-covered Arctic to a perennially ice-free Arctic Ocean happens substantially faster than the preceding loss of summer sea ice. In a few models, the loss of winter sea ice occurs very abruptly after a long time of relatively little change. In the MPI-M Earth system model (MPI-ESM), an ice area of several million square kilometers disappears within only a few years. To remove a similar area of summer sea ice, a global warming of two degrees would be required, and the melting process would take decades. When shown as an animation, the decline of winter sea ice is therefore not simply a replay of the decline in summer sea ice from some decades before, but a completely different movie (Fig. 2). Fig. 2. Evolution of sea ice cover (%) in September (left) and March (right) over time in MPI-ESM. While summer sea ice extent decreases gradually from the edge to the centre of the Arctic, winter sea ice coverage remains high until it is abruptly lost between the years 2123 and 2129 in the extended RCP8.5 simulation. To allow a good comparison, the evolution of ice coverage spans a similar range in both animations. Therefore, the time period is not identical on purpose, since winter ice reaches a certain extent much later than summer sea ice. Interestingly, the abrupt sea-ice loss in MPI-ESM follows the prediction of much simpler column models. They resolve the annual cycle in the Arctic, but their column form allows no horizontal differences. These models show an abrupt loss of winter sea ice at a so-called bifurcation point. The bifurcation scenario suggests that the abrupt transition to an ice-free Arctic is irreversible and a result of large amplifying feedbacks such as the ice-albedo feedback or the convective cloud feedback. The ice-albedo feedback refers to the fact that ice loss and warming amplify each other because more sunlight is absorbed when the bright ice surface is replaced by the dark open water. The convective cloud feedback is associated with the formation of convective clouds above open water which then help to keep the ocean ice-free during the Arctic winter by enhancing the downwelling long-wave radiation. How important are these feedbacks for the fast winter sea-ice loss in complex models? And is the bifurcation scenario of the simple models a proper analogue for the abrupt sea ice loss in complex climate models? Combining expertise from all three departments of MPI-M, Bathiany and his colleagues investigated these questions by suppressing the ice-albedo feedback and convective cloud feedback in the model MPI-ESM. To their surprise, they found that the sea-ice loss is still abrupt even without these feedbacks (Fig. 3). 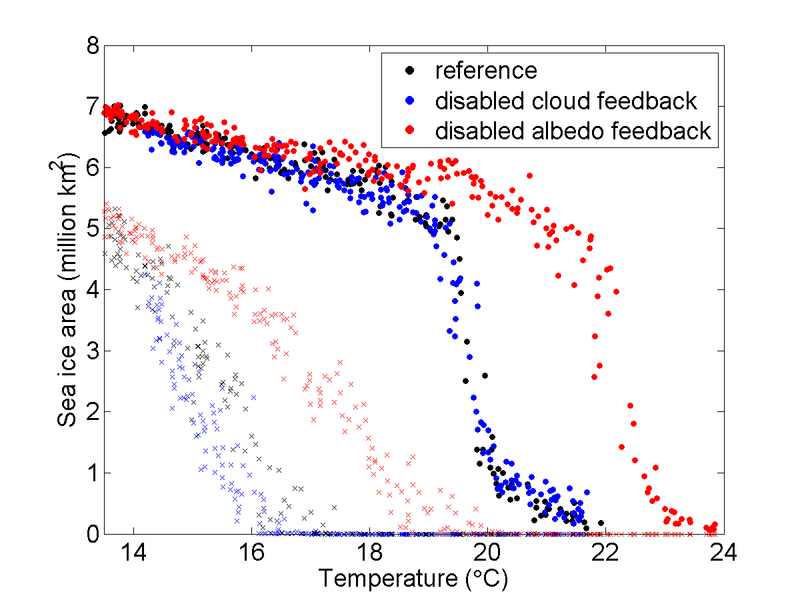 While cloud feedbacks had very little impact on the result, disabling the positive ice-albedo feedback delayed the loss of sea ice. However, the loss of summer sea ice then occurs even more slowly, while winter sea ice still disappears at a very sharp transition point. Hence, neither the ice-albedo feedback nor the radiative cloud feedback can explain the different sensitivity of summer and winter sea ice. Fig. 3. Arctic sea-ice area in March (dots) and September (crosses) versus global annual mean surface air temperature in three experiments with MPI-ESM. It then became clear that the large sensitivity of the winter sea-ice area is caused by the asymmetry between melting and freezing. An ice-free summer requires the complete melt of even the thickest sea ice, which is why the ice coverage decreases only gradually as more and more of the thinner ice melts away. 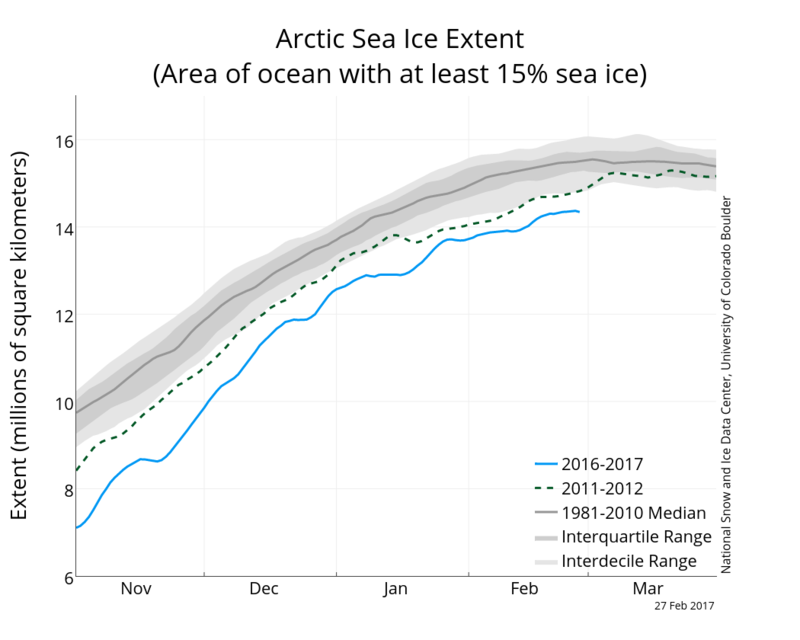 In the case of seasonal ice, however, sea-ice areal coverage remains high as long as sea ice still forms in winter, and then drops to zero wherever the ocean warms sufficiently to no longer form ice at any time of the year. As sea-surface temperature in the winterly Arctic Ocean is relatively homogeneous, this can result in a rapid reduction of ice area within a short time span. Hence, the situation resembles the behaviour of a lake that is suddenly covered with a thin film of ice after one cold night. If the next night is slightly warmer, the lake rapidly loses a substantial areal coverage of ice. Hence, the freezing temperature acts as a natural threshold which is independent of radiative feedbacks. As this process is very fundamental, it occurs in every analysed model independent of any specific parameterisation and is therefore likely to be relevant in the real world. The threshold mechanism suggests that rapid winter ice loss is indeed a possibility, but that this loss is still a reversible phenomenon. Can abrupt sea-ice loss be anticipated from observations? In a second study published in The Cryosphere, Sebastian Bathiany, Dirk Notz and colleagues from the University of Exeter (UK) and the University of Wageningen (NL) further investigated whether an abrupt sea-ice loss can be predicted from observed trends in variance or the temporal correlation between one year and the next (autocorrelation). The theory of dynamical systems suggests that an increase of these statistical properties can indicate a loss in stability. Hence, rising variance and autocorrelation have been proposed as early warning signals of upcoming abrupt shifts. If this theory could be applied to sea ice in the real world, it would open the possibility to predict abrupt sea-ice loss without using any model, and would help provide an independent source of information about which future scenario of sea-ice loss is most plausible. In contrast to this promise arising from very idealised dynamical systems, Bathiany and colleagues found not an increase, but instead a robust decrease of variance and autocorrelation of sea-ice volume before summer sea ice is lost, independent of how abruptly the sea-ice loss occurred in any sea-ice model. They attribute this to the fact that thinner ice can adjust more quickly to perturbations. After the loss of summer ice, the ice's response time, and thus autocorrelation, increases, mainly because it becomes dominated by the ocean water's large heat capacity when the ice-free season is becoming longer and longer. These changes are robust to the nature and origin of climate variability in the models and do not depend on whether Arctic winter sea-ice loss occurs abruptly or irreversibly in a model. Bathiany and colleagues also show that the current rate of climate change in the Arctic is too large to detect significant variability changes in time. Based on these results, the prospects of seeing early warning signals before an abrupt sea-ice loss at a tipping point seem very limited. Having destroyed one promise, however, Bathiany and colleagues replace it with another: It is possible to infer the variability of sea ice properties in past and future climates despite only short observations or reconstructions. As a robust relation between mean and variability of sea ice properties is indicated by all models and can be understood from first principles, the results have implications for the variability of sea ice in a vast range of climates from a fully ice-covered Earth to a completely ice-free Arctic.